Ensemble Travel® Group recently recognized its newest class of “Ensemble Elite” members with a special celebration held in June 2018 at Club Med Marrakech La Palmeraie in Morocco.The event recognized the organization’s top-producing members in the U.S. and Canada based on Ensemble preferred supplier sales in 2017, and featured a number of customized sight-seeing, culinary, and shopping excursions exclusively created by Club Med for this special audience in concert with Ensemble’s newest partners – Sahara Experience and Morocco National Tourist Office. Ensemble Vacations Magazine Wins Gold - BEST TRAVEL mAGAZINE 2017! (TORONTO, ON - Feb. 14, 2018) -- Ensemble Vacations was recently awarded the top recognition for best travel magazine in the 2017 North American Travel Journalists Association (NATJA) Travel Media Awards Competition. After winning bronze and silver in the past, this marks the first time for Ensemble to earn the prestigious gold. NATJA Awards were presented to publications, travel journalists, and photographers whose work was published in print and online media from September 2016 through August 2017. The competition, now in its 26th year, honours the “best of the best” in travel media. In the “best travel magazine” category, National Geographic Traveler took the silver medal. 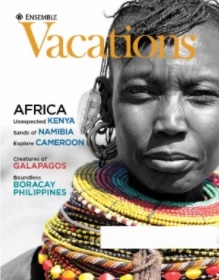 Vacations magazine is exclusively created and published by Ensemble Travel Group and distributed to Canadian consumers. The quarterly magazine is mailed to Ensemble clients across Canada. The editorial line-up offers a well-rounded assortment of travel stories that cover top destinations, new trends, culinary experiences, and travel news. Features include Extraordinary Experiences, which showcase once-in-a-lifetime experiences, and Worldly Delights that tempt the reader with culinary vacations and destinations. In addition, the Ultimate Family Vacations section has tips and inspirational stories on perfect multi-generational getaways. Each issue also features a full selection of special offers and exclusive products. Vacations is created by a small but dedicated Ensemble Travel Group production team, including Creative Director Liz Scull, Editor Karen Snider Leiva, a design team at FOXX Advertising and Design, and the support of many Canadian travel writers who explore the globe to provide the inspiring content through their storytelling. Founded in 1968, Ensemble Travel® Group is a thriving member-owned organization of approximately 850 top-tier independent travel agencies in Canada and the U.S., with an expanded international presence in Australia/New Zealand. With a membership that represents billions of dollars in travel sales each year, Ensemble Travel Group has achieved a 50-year record of boosting members' profits and delivering high-volume sales to its preferred suppliers. To learn more about Ensemble Travel Group, call (416) 367-3660 in Canada, (212) 545-7460 in the U.S., or visit www.joinensemble.com. SAN DIEGO, CA - 20 OCTOBER 2016 – At one point in his career, “Shark Tank” TV star and successful business owner Robert Herjevac let his travel agent go in favor of his staff booking their own business travel. He recalls it as “one of the worst decisions I ever made,” and soon after reunited with this travel advisor. “She sells something that I can buy online, but she adds value to it,” said the recent Dancing with the Stars contestant and former Dragon’s Den panelist. Herjavec made his remarks before an audience of nearly 900 travel professionals last month in San Diego, CA, including TERRI JO LENNOX, President and BRENDA SBROZZI, Business Development Manager from TRAVEL TIME Inc. TERRI JO & BRENDA were attending the annual conference of Ensemble Travel® Group, a member-owned organization of approximately 850 top-tier, independent travel agencies in Canada, the U.S., Australia, and New Zealand. TERRI JO & BRENDA were joined by other travel executives from around the world at this large industry gathering held this year at the Manchester Grand Hyatt in San Diego. In addition to Robert Herjavec and a series of business and industry speakers, conference delegates learned of new products and programs developed by Ensemble Travel Group, all designed to significantly enhance their customers’ vacation experiences and improve their agency’s profitability. In terms of a business outlook, early indications show 2017 as a banner year across all travel segments, with Europe coming back strong for members of Ensemble Travel Group, based on the results of an Ensemble Insights Survey released at the San Diego conference. For overall bookings in 2017, 62 percent of the respondents expect sales to increase when compared to 2016 activity (29 percent said unchanged; 9 percent said down), with Europe rebounding for 46 percent of the participants in the year ahead, compared to an anticipated decrease expected by 49 percent of respondents for Europe bookings in 2016.